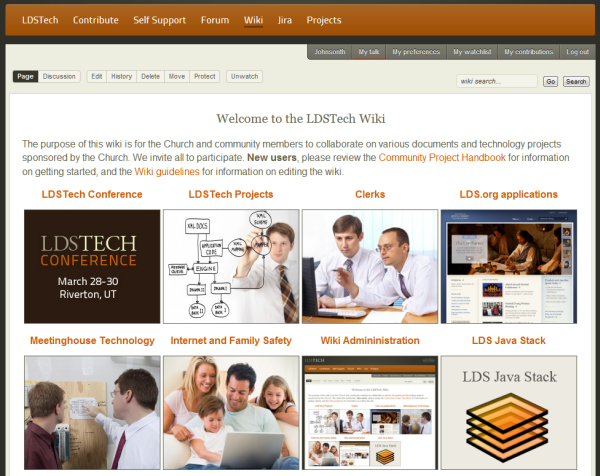 Nearly every LDSTech project uses the LDSTech wiki as a platform for project information. Besides project information, the wiki has information about LDS.org applications, meetinghouse technology, clerk-related topics, family safety, and more. The LDSTech wiki uses Mediawiki, the same wiki platform as Wikipedia. 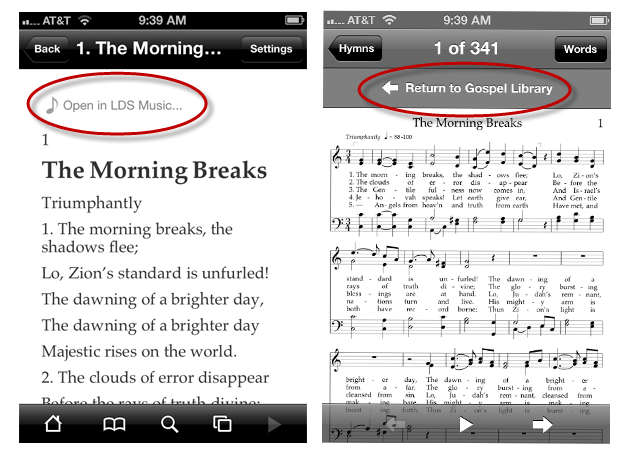 On the LDSTech wiki, any user who logs in with an LDS Account can make edits to pages. However, you do have to understand a little about wiki syntax and rules as you make contributions to the wiki. 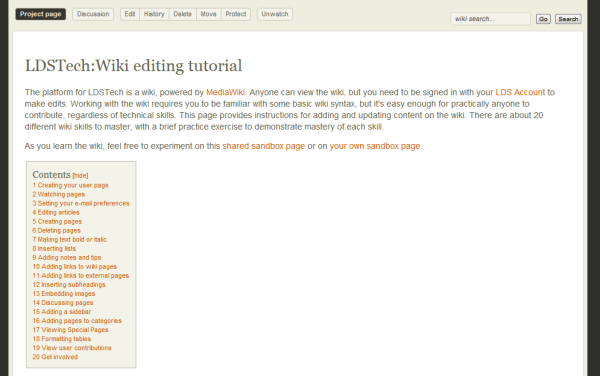 As a learning resource, a Wiki editing tutorial page is now available. The tutorial provides about 20 steps you can walk through to get up and running on the wiki. Check out the wiki tutorial. If you complete the tutorial steps, add a comment to this post about your experience. The resources under the Tools menu on LDS.org provide a wealth of new applications to help members and leaders in wards and stakes. When you sign in with your LDS Account, the options that appear in the Tools menu are personalized to your calling. Many of the tools are standard for all members, such as the directory and calendar, but some are more specialized for bishops and stake presidents, such as Leader Resources and Clerk Resources. 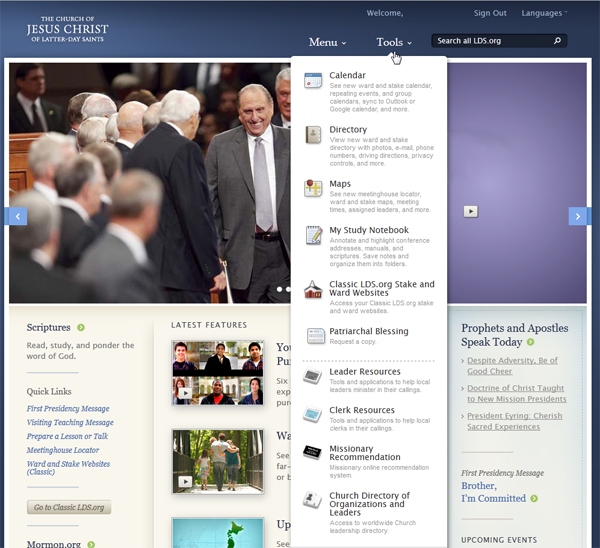 The following screenshot shows the resources available to a stake president’s login. Below is a brief introduction to some of these resources. If you don’t have an LDS Account yet, go to ldsaccount.lds.org and register for one first. You will then be able to access these resources. All stake and ward members can coordinate and communicate Church meetings and activities through the ward and stake calendar. You can create as many calendars as you need for each organization in your ward or stake. You can also add any member as an editor to manage calendar events. The 2.0 version of the calendar was released today. This new version presents a redesign of the administrative interface and many new features and fixes to make the calendar more intuitive. 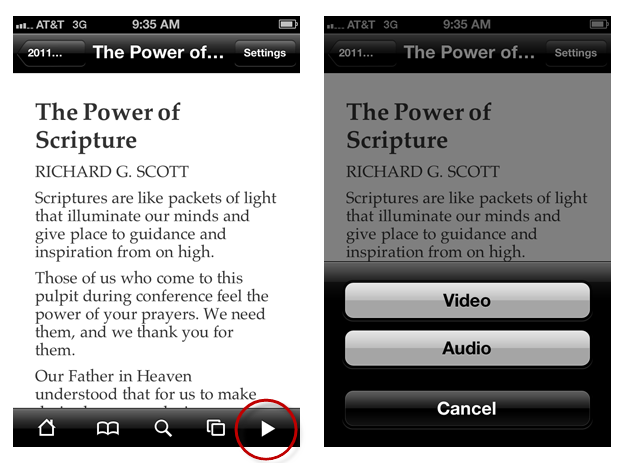 Click Help in the calendar to access videos and information to explain many of the new features. Several calendar training webinars for administrator and calendar editors will be held in mid-November. More detail on the webinars will be given shortly. You can view photos, leader callings, e-mail addresses, and other contact information for members and leaders in your ward and stake through the directory. You can upload profile and family photos, update your personal information, and keep your contact information current. You can also decide whether your personal information is visible to other ward and stake members. Administrators, as authorized, can make changes for individual and household units. 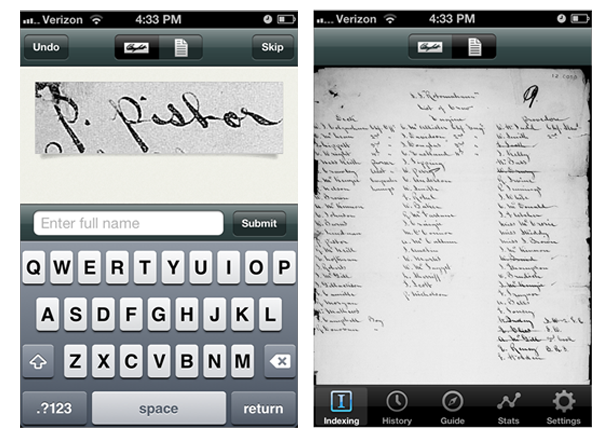 The directory can also be printed as a photo directory or exported into a spreadsheet. 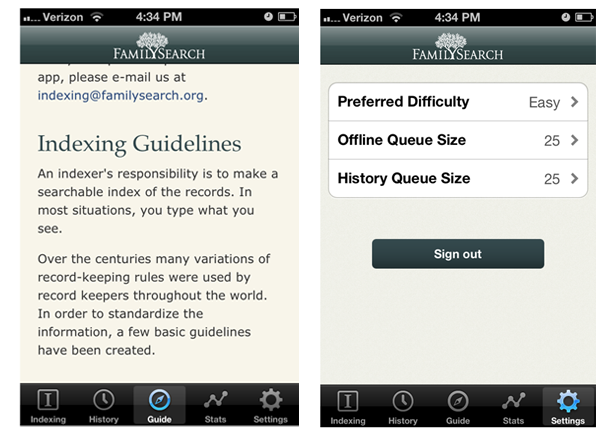 On mobile devices, you can view the directory through the LDS Tools app on Apple and Android platforms. LDS Maps helps you find Church facilities, such as meetinghouses, employment resources centers, and LDS Family Services centers. You can get driving directions, worship times, and hours of operations for each facility in your area. LDS Maps can also be useful in organizing emergency preparedness plans and response efforts. When you sign in with your LDS Account, you can see your own ward boundaries, where your ward and stake members live, view leadership contact information, and view other kinds of Church facilities and buildings worldwide. Members can also hide their location information from other Church members. My Study Notebook is your own personal, private space on LDS.org to collect your gospel content and notes. Study Notebook is especially useful if you’re doing research for a talk or lesson and are browsing resources across LDS.org, since Study Notebook allows you to gather all of this information into one place and organize, sort, print, or download it. 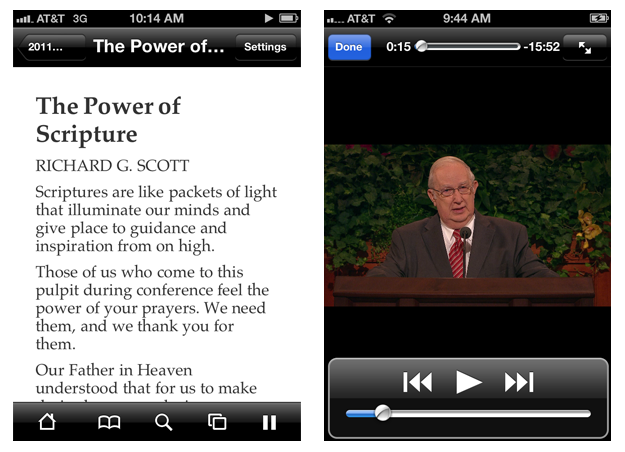 As you’re reading content on LDS.org, look for a black Study Notebook toolbar to appear on the footer. 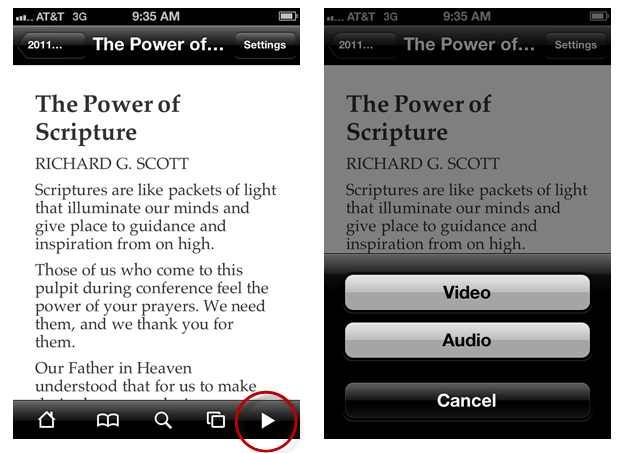 The toolbar appears when you’re viewing scriptures, lessons, magazine articles, and conference addresses. The toolbar will prompt you to sign in (if you haven’t already). 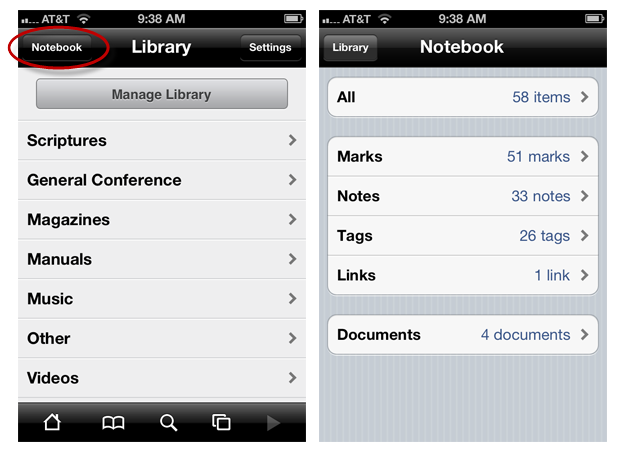 Once signed in, you can highlight passages, add notes, and save this information to your Study Notebook. Stake presidents, bishops, clerks, and secretaries can sign into Leader Resources or Clerk Resources to view training, tools, and information specific to their calling. The resources include links to the ward calling list, reports from MLS, focus lists, and other useful tools for working with members. These resources are consolidated into one secure, online location, so leaders can spend less time managing administrative details and more time ministering to members. Access to Leader Resources and Clerk Resources requires that leaders have the properly assigned, standard calling in MLS. New this month in Clerk Resources is the ability for membership clerks to edit member information online (beyond just phone numbers and addresses). Clerks can also create, edit, and submit Quarterly Reports. Mission presidents with ecclesiastical responsibilities can access member reports and membership records of members living in units assigned to their mission. More MLS features will continue to migrate online throughout 2012. Please let us know your questions and how you’re using these tools in your ward or stake. You can ask questions and help others by participating in the LDSTech forum.